Black Rifle Coffee Company has vowed to hire 10,000 veterans just days after Starbucks Coffee vowed to hire 10,000 refugees. Starbucks CEO Howard Shultz reacted to President Trumps temporary travel ban from refugees from seven foreign nations by pledging to hire 10,000 refugees. 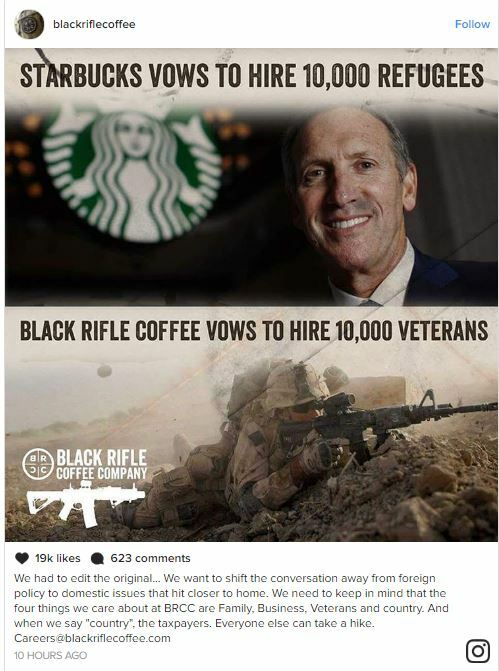 Evan Hafer, founder of Black Rifle Coffee Company, and former service member, reacted to Shultz’s announcement by pledging to hire 10,000 veterans via social media. The statement to hire 10,000 vets was made in jest, but reflects the company’s hiring practices. It’s unlikely that Black Rifle Coffee will need to hire 10,000 employees anytime in the near future. That doesn’t negate the fact that Black Rifle Coffee has made it a point to make hiring veterans a priority. Hafer made hiring veterans one of his first priorities as founder of Black Rifle and shows no signs of changing his philosophy.